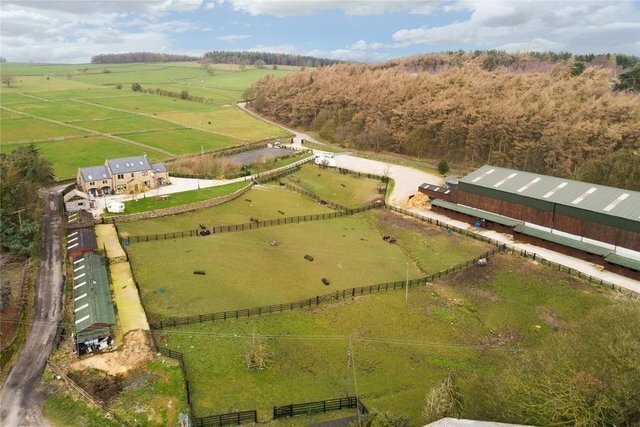 The equestrian centre is situated within beautiful rolling countryside, yet with excellent transport links via A1 motorway a short distance away. It is an excellent venue for multiple equestrian facilities and the sale offers an opportunity to acquire a well-established business with considerable earning potential. The exclusive indoor competition arena, which benefits from rubber and waxed sand surface, heating viewing area and extensive lighting and training mirrors for the winter evenings. Adjacent to the arena is a covered automated Monarch five horse, horse walker with rubber matting.A suitable floodlit all weather outdoor arena measuring 20mx40m with a range of show jumps. Running alongside the arena there are 31 wooden stables 12ft x 12ft all fitted with water feeders. There are two field shelters located in the adjoining paddocks. Additionally, there are several tack and rug rooms, a wash box and an equine solarium. The facility offers livery and schooling 7 days a week.